sold the price had to be dropped by about 5 cents (.05 dollars). sales are too large, the price per suit will be very small and the revenue will be too small to realize a profit. Also we would like to know the number of sales where the profit will be a maximum. P(x) = R(x) - C(x) where x is the number of suits sold. p(x) = -.05x + 80. R(x) = p(x)x = (-.05x + 80)x. C(x) = 20x + 10,000. 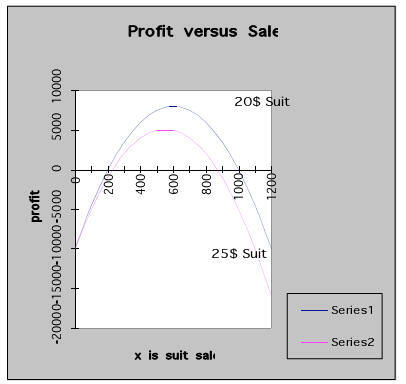 = -.05x2 + 60x - 10,000.
level of sales where P(x) = 0, and the level of sales where the profit will be a maximum. 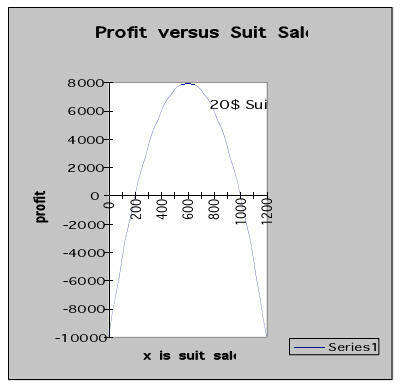 maximum of 8000 dollars if x = 600 suits are sold. = -.05x2 + 55x - 10,000.
attained when x = 550. What will happen if the price per suit decreases from 20 to 15? The derivative method is particularly useful if the price function is not linear. tell it to do so. This means its solutions are generally more accurate than working with a calculator. to take the derivatives of functions. We will then use the derivative to maximize the profit. First let’s discuss the symbols used. you can include numbers and the underscore character (_) if you like. 2. The functional operator -> tells Maple you are defining a function. 3. The semicolon ; tells Maple you have completed a command. at what you typed, find what you typed wrong, and try again. will need to tell it when to multiply. Observe that we did not type a comma to separate 10 from 000; that would confuse Maple. (-.05 x + 80) x – 25. x – 10000. P := x ->(-.05 x + 80) x – 25. x – 10000. The company would earn $4,000 if they sold four hundred units. second command, diff(), but we will not study it. represents the derivative of the argument. Hence the maximum profit is $5125. It occurs when 550 units are sold. Step 1. Open a spreadsheet and type in x in cell a1 and P(x) in cell b1. Step 2. In cell a2 type in 0 and in cell b2 type in "=-.05*a2^2+60*a2-10000". Step 3. In cell a3 type 100 and in cell b3 type in "=-.05*a3^2+60*a3-10000". lower right corner of cell b3 and "dragging" it down to cell b14. incremented by one each move down column b2:b14. function for the 25$ suits. Step 1. Use the "chart wizard" and select the above cells a2:b14. Step 2. Click the “chart wizard” button. Step 3. Choose “scatter” chart. Step 4. Follow the instructions. Step 1. Define the revenue function R and the cost function C.
Step 3. Use that result to define the profit function P.
Step 4. Define dP, the derivative of P, using the D() function. Step 6. Find the maximum profit by evaluating P at that point.